Soviet air force officials announced today that formations of their warplanes would fly over Berlin, which immediately evoked a British protest that such maneuvers were contrary to safety regulations and dangerous to the Berlin airlift. This is the second protest in twenty-four hours against Russian plans to conduct training maneuvers in the area of the airlift. The Russian formation flying, if it comes off, would be across three corridors into the city. However, American officials have made no protest against today's planned flight of Russian planes. Colonel B. E. Steadman, chief of the Air Force branch in Berlin, told me an hour ago that air safety authorities every day receive notices of Russian formation flying and that this is normal. There probably would be no hullabaloo raised by this flight ordinarily, Steadman said. Thus far nothing has been seen of any formations of Soviet fighters and bombers over Berlin. The only planes in the air are the streams of American and British cargo ships bringing in supplies. Russian planes have appeared over this city in formation only once before. They flew extremely high and caused no bother. Yesterday morning the British and Americans protested against announced Russian maneuvers alongside the air corridor at Dolle, near Magdeburg. The Russians said they intended to carry out air-ground exercises which would involve the use of antiaircraft fire, fighters, and ground strafing. However, our planes continued to operate over this area throughout the day, and although there have been reports and rumors of much activity dangerous to the airlift, this morning it turns out that there was nothing to it—no Russian fighters sighted, no firing, no ack-ack, no nothing. So, as of now, all the worried speculation and unconfirmed reports of Russian interference in the airlift is mostly newspaper talk. There have been no incidents. The bitterness that is spreading between the East and Western sections of Berlin—bitterness that is indicative of the larger and more strategic struggle between nations—evidenced itself today when young anti-Communists of the British sector attempted to break up an outdoor meeting of the Communist Party in the Western sector of Berlin. Western sector police fought off some fifty young hoodlums who attempted to rush the speaker's stand in which a German Communist speaker was denouncing America and other Western Powers. 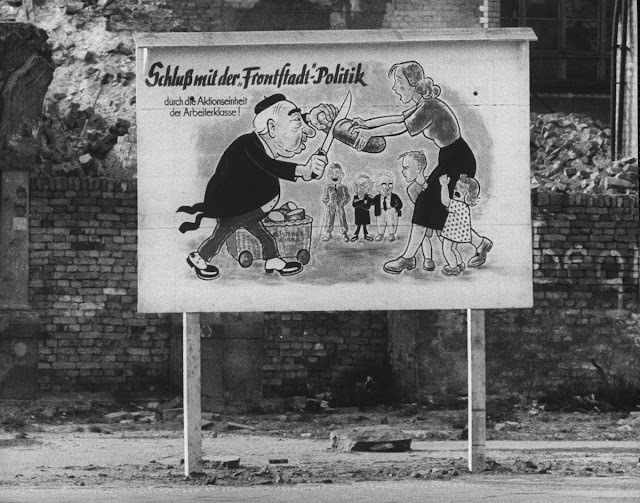 British military authorities ordered German police to preserve order since the Communists had legally obtained permission to hold their meeting. Two men have been arrested. The Communist meeting in the British sector, held near the Tiergarten well inside the British zone, drew some 2,500 people, most of whom were believed to be hecklers. The main Communist speaker—as if to emphasize the contrast—was one Friedrich Ebert, the son of the first president of the Weimar government. 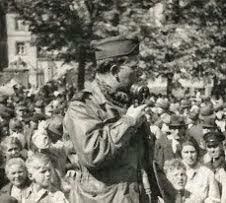 He had marched with a crowd of some 150 Communists to the Kleiner Tiergarten, all wearing red armbands. Ebert charged that the Western Powers are provoking war. The airlift to Berlin, he declared, was only a base for the beginning of an atomic war. The battle of Berlin, which is being fought by the Eastern and Western section Germans taking their cues from Moscow and Washington, meanwhile gets tougher. The British, French, and American military governments in Berlin outlawed in their sectors the Soviet-sponsored newspaper distributing agency from operating there. This was in retaliation for a similar outlawing of Western zone distributors. The much-publicized formations of Russian fighters and bombers which were supposed to carry out flights over Berlin yesterday did not materialize. Despite some rather hysterical reporting on the possibility, US Air Force headquarters say they have not had reports of them—just as they had no official reports of antiaircraft fire in the air corridor between Berlin and Frankfurt yesterday.